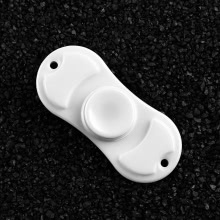 It is the top spinner for your relief, entertainment and amusement, which is small, simple and funny as well, moreover effective in relieving anxiety and stress! It is great for keeping your hands busy at your workplace or desk, so that you won&apos;t get fidgety. Focus enhancement: By boosting focus, reducing anxiety, and building concentration with fun, this toy is great for ADHD, Autism, focusing, staying awake, reducing anxiety, calming you down, and entertainment. Smooth spinning design: It is specially designed for high speed and smooth play. Equipped with premium-quality bearing and precise balance, users can enjoy high speed spinning constantly in any setting. Excellent hand feel: With elegant appearance, silky-smooth texture, cool and graceful design, users can enjoy it without distraction at parties, meeting, during trips, or both indoors and outdoors. Versatile finger & table-top spin: It can be played with one or two hands or even on office tables and hard counters. Multiple ways to play, multiply your fun. Portable and mini: Perfect size for fun on the go without distractions. It is easy to clean, easy to carry, and easy to use. Just strike one end and enjoy the fun of spinning in the setting you want.